Free to Play Penalty Fever, start your free game now (2016). 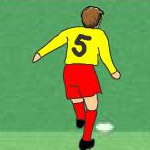 Description: Penalty Fever, Try to kick the soccer ball and get it into the goal. Then switch and defend your goal.